Oooh, Asian food fever has gripped the household and I am totally going for it. So much for the “food of love month”, eh? This theme is waaay better and I think it’s because deep down inside I am missing home again. Well, not so much home but food of the region … especially Cantonese-style cooking which is essentially comfort food to me. Today’s soup dish, however, has its origins firmly placed in the Szechuan province of China, but is commonly served in generic Chinese restaurants the world over. In 2005 (or was it 2006…?) I was fortunate enough to have bought myself a trip to Hong Kong and the city completely blew my mind. Hong Kong is frequently referred to as the sister city of Singapore because they share many similarities ~ the tall apartment buildings, a rapid and efficient metro system, fast paced city life, the relative high cost of living and its people who all live to do only two things in life ….that is to eat and shop til they drop. I myself was living in Singapore at the time and hence the first impression of Hong Kong was a strangely familiar one; I really did feel as tho I had simply walked into a mirror image of Singapore … at first. But soon enough the similarities melted away and the true vibrant nature of the island city came to the fore. For starters it was March and a hell of a lot colder than it was in Singapore. The icy winds cut right thru me, made all the worse by all the tall buildings blocking out the sunshine and creating wind tunnels everywhere. The photo below depicts just such a gust that slammed into us just as the shutter of the camera snapped shut. Those are my pals from work by the way, Dominic and Rachel; I am in the middle. Dominic is a citizen of Hong Kong and he was kind enough to open his apartment up for Rachel and I to crash while we visited his awesome country for the week. He even took time off work to play tour guide, show us the sights and translate all our requests to shop vendors. At the time I was more interested in taking pictures of myself with famous monuments in the background rather than focus on the food I consumed. In hind sight I should have done better with the food shots because food in Hong Kong was amazing and they seem to come in large portions; big bang for your buck. We ate everything from hawker stall food to market kiosk snacks, tourist attraction food and home grown proper Cantonese food at a fancy restaurant. 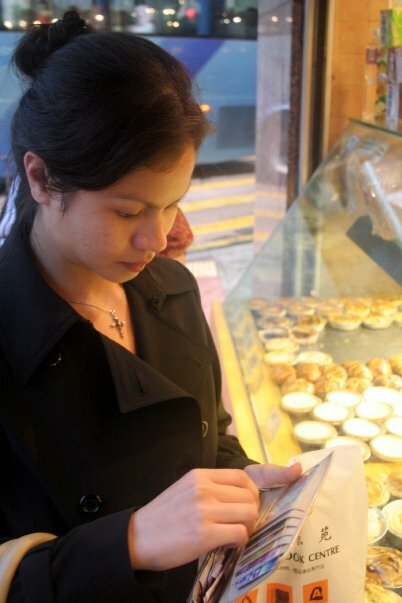 Buying beautiful Hong Kong savoury pastries and egg tarts. 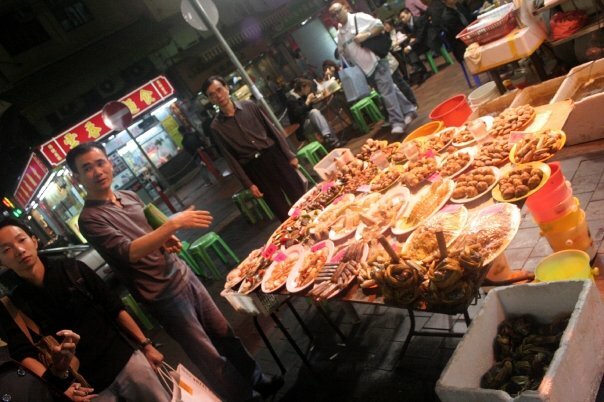 A hawker seller inviting us to check out his offerings of live shellfish and seafood delicacies at a night market. Ahhh … such fond memories of Hong Kong. Even though I found it expensive (was still a very lowly paid junior nurse back then), I still felt the trip had opened my eyes to many fresh experiences and tastes. We even hopped over to Macau for the day on the hydrofoil and sampled some interesting Macau dishes; steamed egg custards, a veerrry spicy fish dish, the name of which escapes me and a flaky almond biscuit that every tourist there seemed to be buying by the boxes. 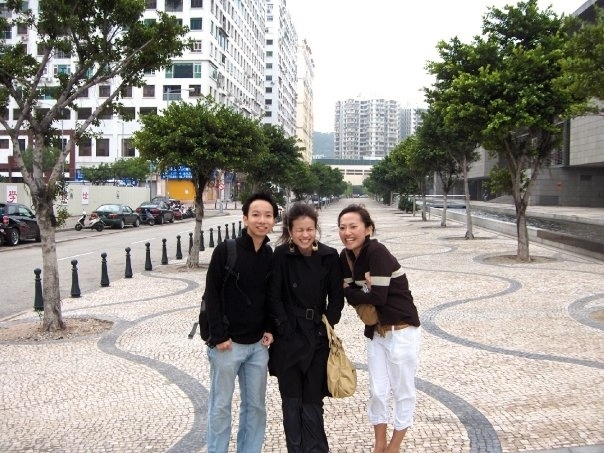 I believe Hong Kong was the first ever international travel I did for myself … purely financed by myself, as well. I was rather poor in 2005 … I hadn’t been working long and I was saving money for bigger and better things in life so my budget was fairly tight. Oh, how I wish it wasn’t that way … I would have sampled so many more food dishes. Why? Because Hong Kong food is to die for, not merely limited to fantastic wanton noodles, succulent sweet roast pork and iced milky tea. 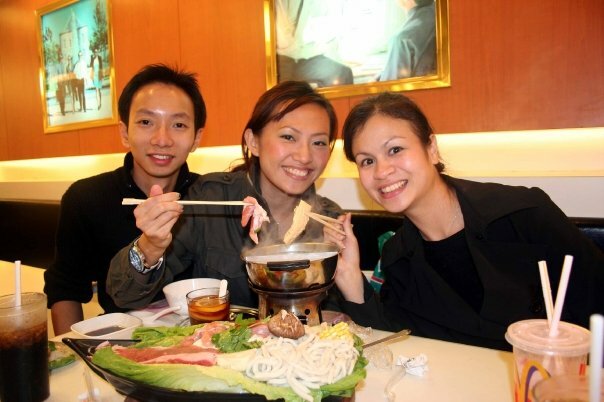 Hong Kong is a giant melting pot of culinary flavours. I wonder if the boyfriend would be interested in visiting Hong Kong with me. Somehow, deep down inside, I highly doubt it. Travelling through European countries with him is hard enough let alone Asian ones. He might like Singapore tho. Anyway, back to the subject of soup. This soup, as I said earlier, has its origins in the Szechuan province of China but is pretty popular in all Chinese restaurants. As the name suggests, this soup has a bit of a punch to it in the form of spice from chillies and peppercorns, as well as an acidic twist from black vinegar. Man, black vinegar used to annoy the crap out of me at restaurants because they look so similar to soy sauce. Invariably, I would end up with very sour sweet corn soup until I learnt to sniff the bottle first before tipping its contents over my food. The good news this week is the dog is home once again after a two-night stay at the hospital following his lung biopsy procedure. As we were unsure what condition he’d be in when we went to pick him up on Sunday we rented a car instead of subjecting the poor creature to public transport all the way from Utrecht to Amsterdam … and you know what that means. Having a car enables me to simply drive be driven to the Asian store that would otherwise be an inconvenient trip involving buses and lots of walking. And going to Asian stores always gives me ideas and I start throwing ingredients into my basket at random, which also makes me thankful for the car considering by the time I walk out of there I would be lugging upwards of five kilos worth of stuff. Once home I set about cooking my soup immediately. If using the ready-made soup paste like me then it’s all pretty smooth sailing from there, you only have to decide what condiments you wish to include in the soup. Typically this soup contains bamboo shoots, wood fungus and day lily buds, but I improvised a little to suit both my budget and my taste. Certain Asian ingredients here cost an arm and a leg, so instead of using the black wood fungus I substituted with dried Chinese mushrooms, and I also added crab meat to the mix. If you’d like to be authentic and make your soup from scratch then have a look at the YouTube video I tagged onto this post (with English subtitles). I just didn’t feel like buying all the various different components to make the broth, hence the decision to use a pre-mix. 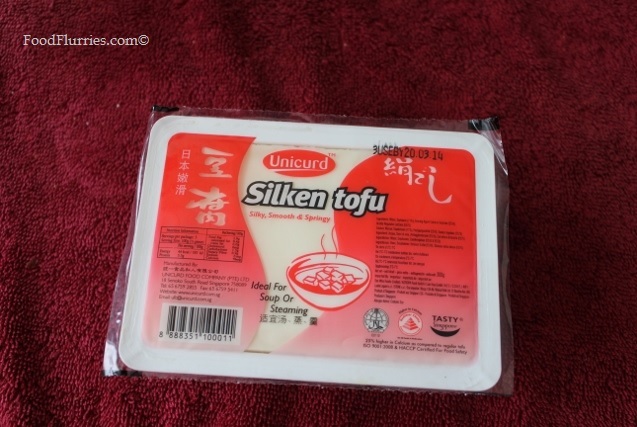 Obtaining the right kind of tofu here is a bit of a chore … the silken variety can only be found in Oriental supermarkets. This variety is soft, delicate and fragile so once you add this to the soup don’t stir vigorously or boil rapidly. 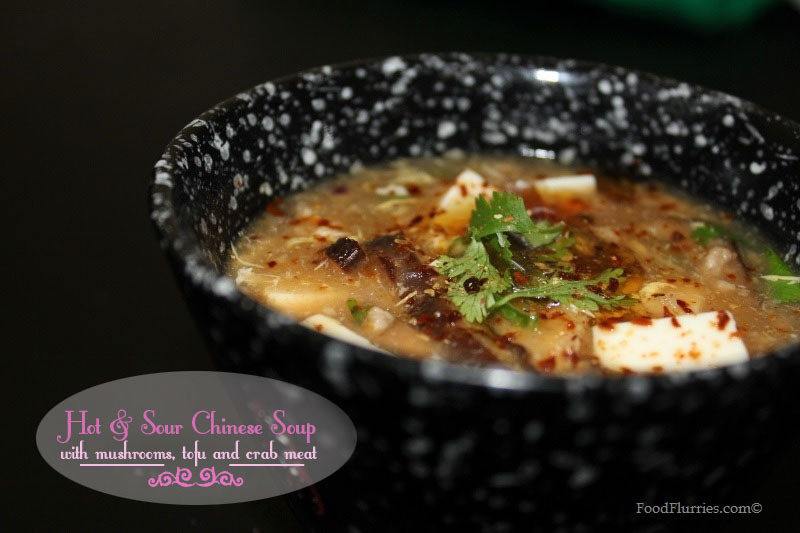 Making Hot & Sour Soup from scratch: a guide by wantanmien. 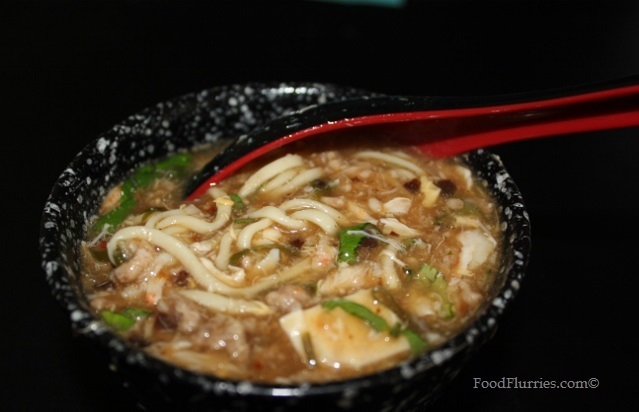 Hot & Sour Chinese Soup with Crab. Sautee the minced pork, onions, ginger and garlic lightly in a teaspoon of oil. Then add in the paste. 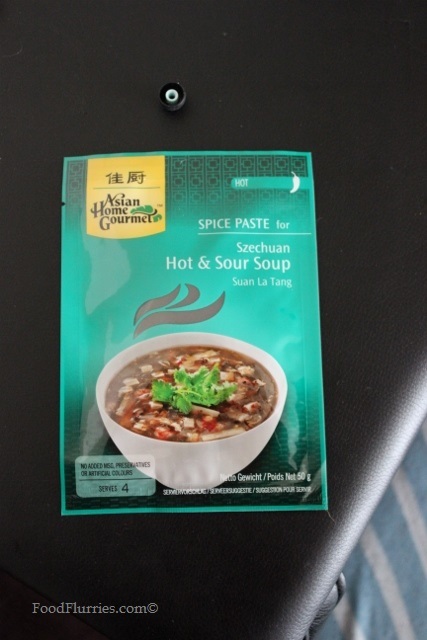 The paste already has chillies and sour bean paste, but taste as you go along. You may want to add extra chilli oil at the end or more vinegar. Once everything is nice and incorporated add the water and the oyster sauce. Now add the mushrooms, crab meat and tofu. Turn the heat down and simmer gently. If using bamboo shoots, lily buds and other types of fungus, add them in now as well. Just before turning off the heat drizzle in the egg whites and stir in the cornstarch slurry. A cornstarch slurry is simply corn flour mixed in with water or cold chicken stock and is used as a thickening agent. Cornstarch is a very common component in many Chinese dishes. Once the slurry is in the soup will thicken almost immediately. Shut off the fire, cover the pot and allow the soup to sit for about ten minutes. Just before serving, add the spring onions and coriander leaves. Don’t forget the obligatory drizzle of sesame oil. In restaurants the black vinegar is placed on the table so people can adjust the sourness according to their taste buds. Me, I’m not overly crazy for sour foods so I keep my soup mild on the acid. But I did add in fresh wheat noodles because by the time i finished making the soup I was starving beyond belief. Oh man, the noodles in the soup worked perfectly. I was a very happy camper. The nice thing about making soups like this on your own at home is that you get to control what goes into it. You get to choose your own ingredients and to control the flavour. Some places I have eaten at make their soup far too spicy while others are a tad over zealous with the cornstarch. I did not add any chilli oil at the end but I did sprinkle some dry chilli flakes to finish off the dish; chilli oil here is too expensive for the real thing. This is a lovely dish that can double as either a starter or as a main meal, depending on how you serve it. I feel it has enough protein in it to fill you up quite nicely. Add fresh noodles and you’re all set to snuggle in on a cold evening with a nice movie playing on tv.